This post is proudly produced in partnership with Wyoming Office of Tourism. THE WEATHER MOVES fast in Wyoming, and so do the seasons. A white-out blizzard followed by cloudless bluebird days is how it goes, beckoning you outdoors to play. Temperatures that sometimes swing from below zero in the morning to the 40s by afternoon make for the kind of magic that comes with a new, perhaps forbidden love affair — the variety, the spontaneity, and the snow-cloaked scenery make me fall for Wyoming’s winter over and over again. Some say winter comes too soon in Wyoming. I’m not one of them. For me, the arrival of snow means it’s time to awaken. The first big storm typically comes right after foliage season — usually sometime around Halloween — and then, with Mother Nature’s blessing, the fluffy stuff will keep rolling in on a weekly basis. And this is the good stuff — cold, dry, light, Continental-Divide snow that piles up in airy sheets ripe for plundering with two planks under your feet. I got hooked on it when I was a kid. My first memories of Wyoming snow came from shoveling the sidewalk with my brother — we would heap all the snow into the yard and leap off the roof into the pile that inched higher with every storm. As we grew older, those leaps turned into adrenaline-filled sled descents, shooting gaps through lodgepole pine forests and trying to catch big air on the jumps that grew taller each year. Eventually, our relationship with snow matured and made the transition to skiing. We started with mountains where the vertical wasn’t huge…but neither were the queues for the two-seater chairlift. There wasn’t a single express lift on our favorite childhood mountain, and riding along with the slow crank of the drive wheel gave me a lasting appreciation for the scent of pine trees and living life at a slower pace. The experiences on smaller mountains like these honed our skills for hunting down stashes of cold-smoke powder, the kind that stays untouched in the tight trees. Nowadays, the snow addiction goes way beyond lift-accessed terrain. It involves scouting big lines off the infinite snow-capped summits that run border to border here, the Rocky Mountains forming the state’s spine. The pursuit of powder motivates us to wake up hours before dawn and hit the skin track, eagerly awaiting the first rays of sun. The huff and puff up the hill can seem endless, but there’s nothing quite like topping out at a summit under a cold glaze of sweat, with stinging lungs, and feeling the distinct satisfaction that comes with a human-powered adventure. And somehow, my love for Wyoming winter grows deeper each year, as does my desire to be deeply immersed in it. I’m learning to dig snow caves, build igloos, forecast weather, and live in the wild and the frost for a night or two at a time. Yes, skiing is still great, but just being out there might be even better. It’s not about adrenaline — it’s about becoming a quiet observer of the winter world. As I grow older, so too does my appreciation for the solitude that Wyoming offers in any season. I love the people who look over the endless open expanses in every direction and see nothingness. But to the enlightened, this is a sanctuary of solitude, especially in winter. At least a couple times a year, I make a mission to find a place so still you can hear the snowflakes shattering on impact. 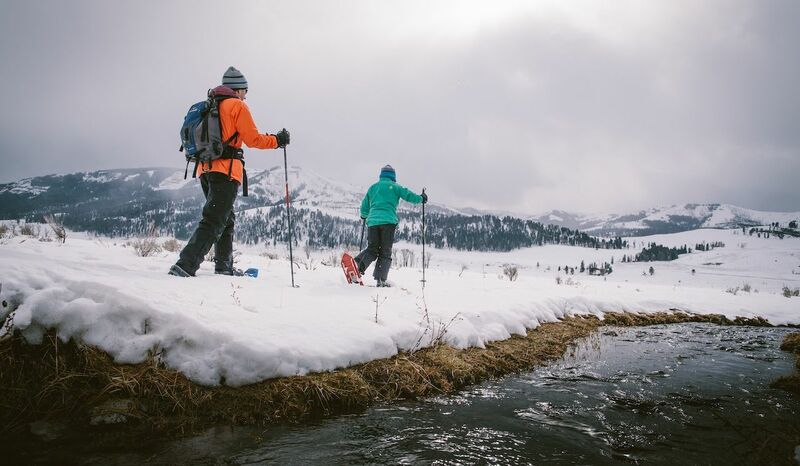 It takes just a bit of persistence to get beyond the tracked-out snow near the trailhead, but plodding into the wilderness in the pursuit of the perfect view is worth it in any corner of Wyoming. And plopping down in a snowbank instantly creates a custom-made throne to enjoy the peace and quiet. What a feeling it is to be a sultan of solitude, drinking in the hushed details all around. The gentle breeze in the treetops triggers a wispy shower of flakes from the overloaded branches. The next storm forms on the mountains across the valley, consuming the landscape in front of me until my own world is shrouded in white. In a world that’s all too noisy, the easy peace found in Wyoming’s wintry mountains and plains is a haven I’ll always return to. Look and listen hard enough, though, and that stillness is never complete. Distant howls from my wild companions bring an eerie interruption to my silent observations. The abundance of winter wildlife takes many forms — one of which has left evidence of a recent romp in the fresh snow. Paw prints dash from left to right and frolic to and fro. Maybe it was the red fox that slinks atop the white crust, stalking rodents that skitter about in the world between the snow and earth. Or maybe it was a snowshoe hare evading the lynx, proving that, somehow, the little creatures can draw more attention than the giants lurking in the distance. Deeper observation of my surroundings reveals a monstrous moose knee-deep in a creek, just downstream of my perch, methodically munching willows without another care in the world. Icicles have formed on the tips of its tangled fur, but it doesn’t seem to mind. Wildlife always finds a way to thrive in Wyoming’s enduring winter. 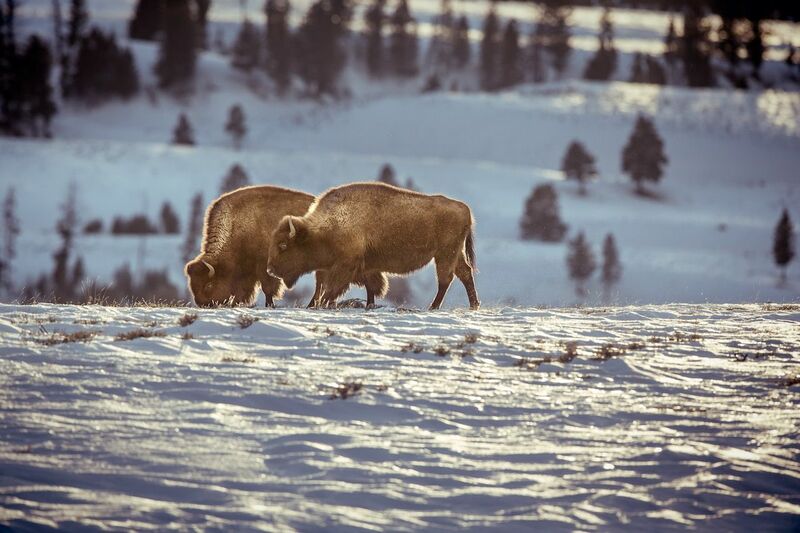 The solitary bison that choose to stay a little warmer by living in Yellowstone’s steamy geiser basins during the coldest stretches of the season; the communal wolf packs that snuggle together to survive the sub-zero nights; the busy rodents that dash about unearthing stashes of pine nuts that sustain them. While it can seem harsh and formidable on the surface, every year I learn more about the valuable role played by the long Wyoming winter. 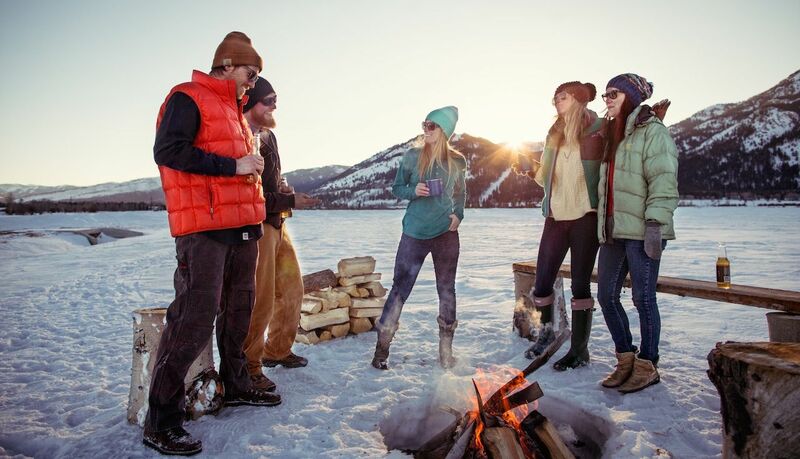 Appreciating winter doesn’t have to involve braving the cold. One of my favorite ways to admire the whitened landscape is from the comfort of a plush chair by the woodstove, kindling a love affair with a mug of hot chocolate and a thick book. Or inviting the friends over, dusting off the recipe for my favorite warm cocktails, and heading out back to the firepit. Winter in Wyoming is a time to unwind — a time to whittle down the reading list, to throw another log on the fire, to brew another pot of tea. It’s time to slow the pace of life, revel in the stillness of the snow-covered surroundings, and pretend my home is an inverted snow globe. Somewhere between the epic powder days and the frigid treks to backcountry hot springs rings the splendor of simply being. The extremes of Wyoming’s winter also serve as great reminders to practice gratitude. To be grateful for a warm, dry place to lay my head and the fortress of firewood that came from the nearby forest. To be grateful for a strong back and a sharp axe, ensuring there will be enough split wood to keep the fire purring all night. 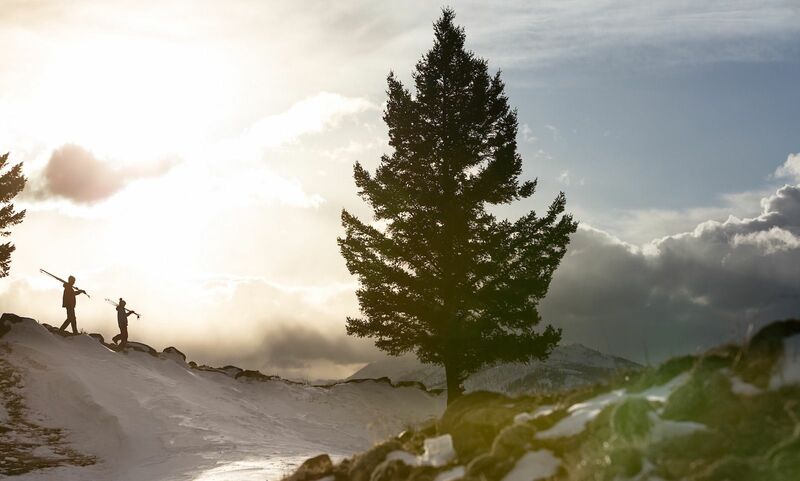 Winter in Wyoming is a reminder to appreciate this ephemeral life and relish in the extreme contrast between seasons. It charges in at the tail end of autumn and slips away come spring. Thank you, winter, for all you have taught me. And to Wyoming, the classroom. All photos courtesy of the Wyoming Office of Tourism.